I finally did it. I finally joined a gym! And you guys, I love it. I joined the YWCA and have been going to the Uptown location since joining last week. And let me tell you, I'm loving it. My favorite part about being part of the YWCA is their schedule of classes. I've found a class almost every day of the week that I'm interested in taking, and at the times I'm available. My favorites? Yoga. 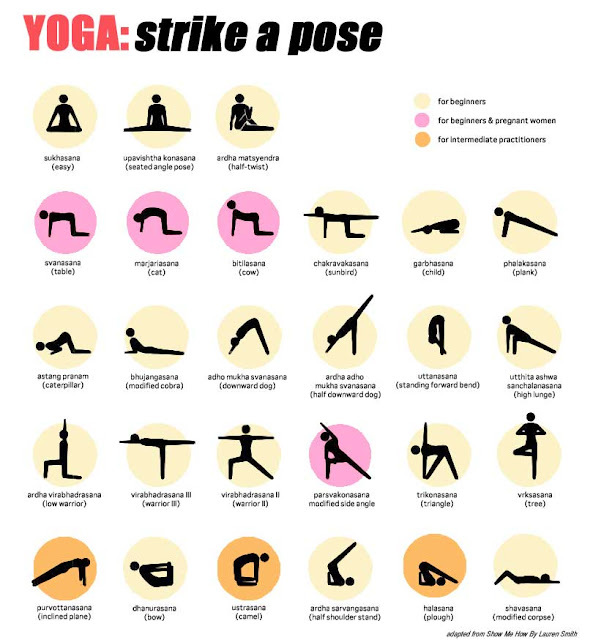 I used to do yoga frequently when I was in college, but over the last year have been practicing it less and less. My busy schedule and tight pocketbook are usually to blame. But to better myself in 2013 (and, in reality, the rest of my life) I think yoga is going to do me some good. So while I've been getting back in the swing of things, it's nice to have a little refresher. I found this cute little infographic on Pinterest and couldn't help but share! Namaste, dears.